Casablanca, the city made famous by a movie. We have three priorities here. 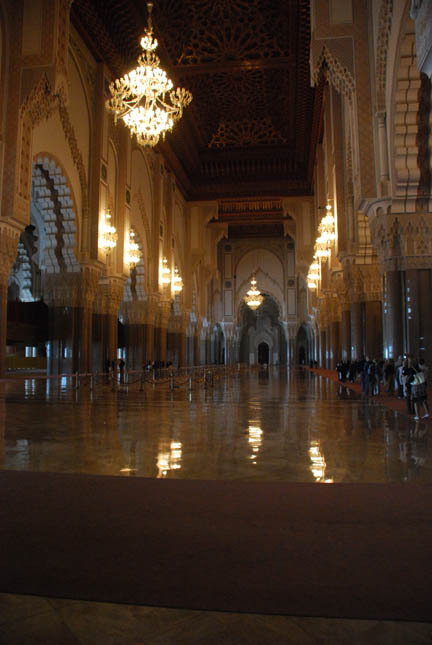 The first is to visit the huge Hassan II Mosque that was built in the late 80's by the current king at the cost of half a billion dollars, or whatever that is in Dirhams. It juts out over the sea next to the harbor. The minaret is 210 meters (over 600 feet) high and has a laser that shines towards Mecca at night. This plaza will hold 80,000 worshippers. 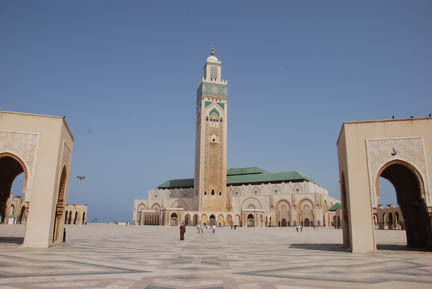 This mosque is also one of the very few that allows non-Muslim persons to enter it, although a guided tour is required. We removed our shoes, their custom in a mosque, and followed our guide. We took the English-speaking tour. Lots of time was allowed for pictures. Inside it will 20,000 men and 5,000 women (segregated) worshippers. It is made with all Moroccan materials except the chandeliers, which are of Murano glass from Venice. The ceiling is cedar from the middle Atlas mountains. The marble is from southern Morocco. The tile work and inlaid marble are gorgeous. And unlike many of the Catholic churches we saw there is not a spec of dust anywhere. The place is spotless. The floor is heated and the ceiling will slide open. 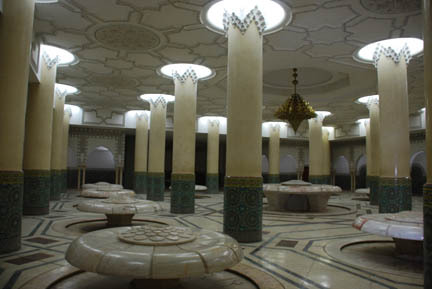 Underneath the heated floor is the ablution area with fountains for the ritual washing of the hands, face and feet before prayer. The tile columns, marble floor and plasterwork ceilings are beautiful. The fountains are also marble. Next in priority was to have lunch at a new restaurant called Rick's Cafe. It is near the mosque but we had to drive around about 3 times before we found it. This four-year old restaurant is based on the movie. 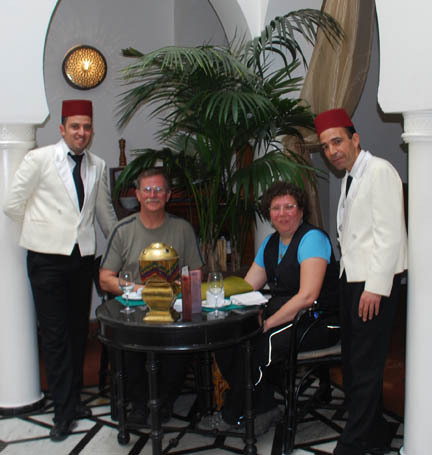 It features waiters in Fez hats and white coats, small tables and palms. It has no movie memorabilia hanging on the walls as would an American version. It was fun and the food was good, but expensive. I bought a t-shirt too. Lastly we met with the president of the GoldWing Club Maroc and another club member. They told us of some places to see and routes to follow. We're on the first of them now on our way to Agadir. 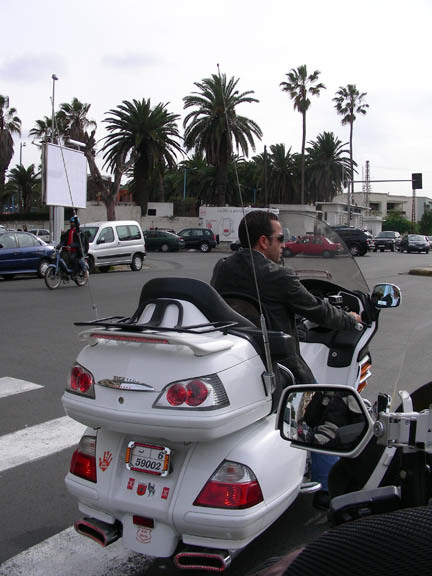 Then he led us through downtown Casablanca at a faster speed than I would do on my own. It is nice having a guide so all I have to do is watch traffic. You'll notice that he has good taste when picking a color for his Wing. Now it is south to al-Jadida.